Happy New Year Sweet Readers! Jemma and I are continuing The PERK Project today and the subject is being REAL. In case you are new here, we talked recently about being positive and encouraging others. While we visit today, I'm sharing pictures of the open shelves in my kitchen as I work on them - completely unrelated but fun. On blog posts we always try to put our best foot forward and I know you don't come here to read something that might be a downer. I've said before that this is my happy place and I get to choose what goes here. 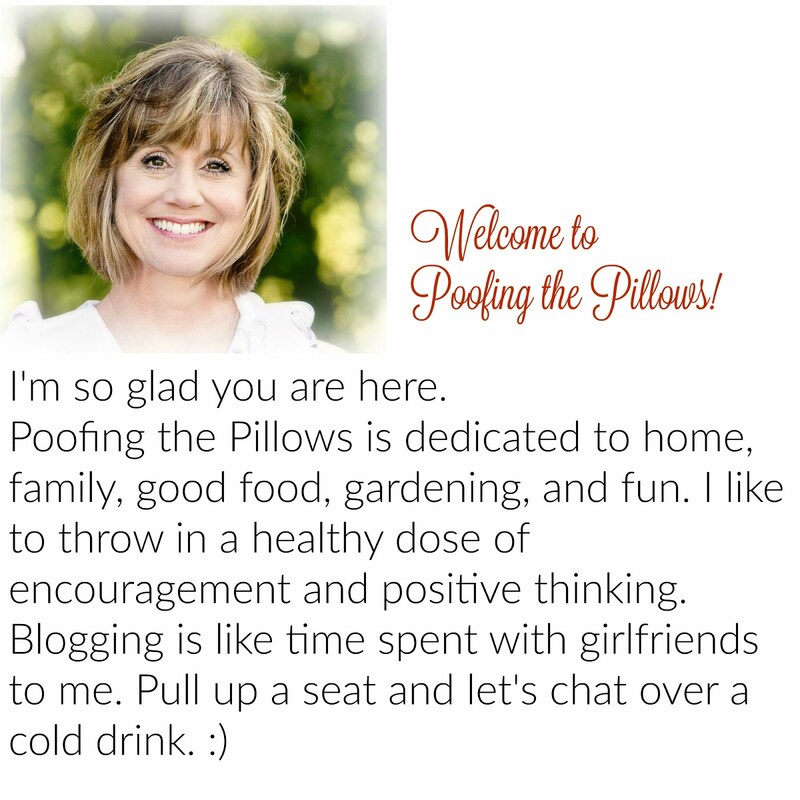 Light-hearted, positive, and sweet is my goal for Poofing the Pillows. The truth is that we all have a little poo unpleasantness in our lives now and then but we don't always show it in a post or talk about it in comments. At a recent blogger gathering, we went around the circle and told something about ourselves that was true or not and the others had to guess which it was. In the spirit of being real here (or not) - let's play that game. See if you can tell what's real and what's not real behind the Poofing the Pillows facade. True or Not #1- Because it's the new year and our 30th anniversary is coming up, I joined CrossFit to get in shape. True or Not #2- Thankfully, every person in our family is well at this time. We have no worries health wise, for the first time in a long time. True or not #3- Our sons are grown men now; our oldest is 28 and our youngest is 25. We never have to worry about them again! True or Not #4- I once road a donkey in a Donkey Basketball game. True or Not #5- Our friends consider us to be rather frugal. On the other hand, my brother shakes his head at the amount of food stocked in my pantry. **Thank you for joining us for The PERK Project. We have one more post coming on January 15th and would love for you to join us in a linky party. We want you to share the ways that you find and share positivity in this world. Write a blog post and share the ways that you encourage others daily or tell what encourages you! Share what's real in your world and we'll cheer you on. Tell us how kindness makes the world better or how you love to show it to others. Happy New Year and here's to keeping it real today. (((hugs))) Stacey. You have a lot going on right now. I don't know if it's a good thing or a bad thing but I scored 100 percent on the Stacey "real" test! Or, if a thing seems too good to possibly be true, it isn't! You've had a year and it looks like another challenging one will be coming up with your dad and husband's eyes and worrying about your boys. Who knows the challenges we don't yet see? I have a feeling you'll need your sparkle. And I'm also pretty darned confident you'll find that sparkle in others. It just seems like you. Thanks for the heads up on the PERK link. Is that next Monday? Or the Monday after? Let's see....I'm still trying to picture you riding on a donkey! hahahaha! But I know about the health challenges AND the worry! It's always there and the challenges continue as we get older (like me). I've read lots of good words for the new year and I love having one to focus on. I'm very....very tempted to ask if you'll share yours! Enjoy your day and your pretty kitchen! Any sugar free cereal in the pantry for me? heehee Hugs! Sparkle it is, oh lady, you’re so wonderful and definitely real. As your readers and friends, We love relating to you. You are the epitome of Encouragement! So in the early years with the boys I thought the worrying would lessen as they got older...nope, it has increased ten fold! Prayers so many prayers! Adore you to pieces and I hope you have a cozy weekend! I love it when bloggers are real, frankly the world is a scary place and although I sometimes like to escape it I would rather a blogger address some of the unpleasant parts of life rather than show pretty stuff all of the time. That said, I know a lot of others do not feel that way. Love your word for the year! Happy New year. Great post! Getting real here....I need to lose 15 pounds and my hubbie 50 pounds! We decided to start the beginning of the year, but have not. Love your word. Mine is Enjoy. Cute post Stacey! Filled hope and reality. I have enjoyed collaborating with you on this project and look forward to the link up party too. Love this Stacey. I would have to say I too scored pretty darn high on the "how well do you know Stacey" test? Just goes to show that while your posts are uplifting, your true self shines (or sparkles) through. Love the word you picked for the year. Love, love, love this post, Dear Stacey. Sparkle is a perfect word for you. You sparkle all across the internet. Lol! I got a good laugh from your Crossfit comment as I was thinking that I wouldn't do that if someone paid me. 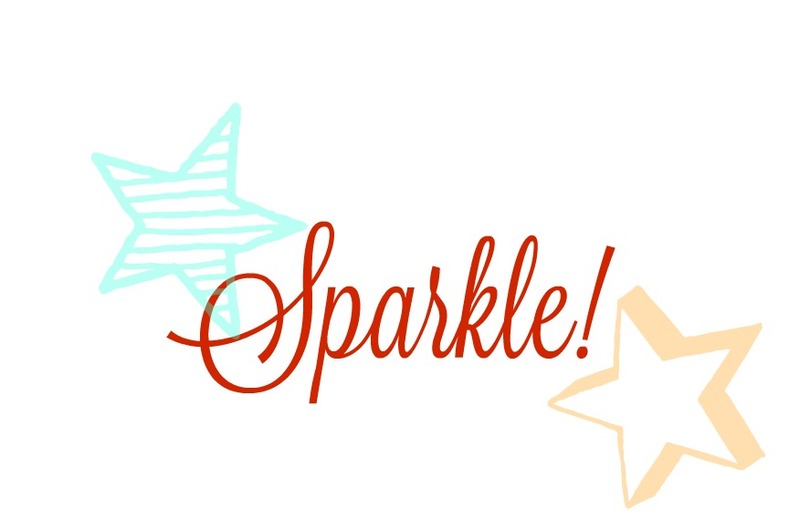 I really enjoyed this post, and Sparkle is the perfect word for you! This post really rings true. You just never know what is going on in someone's life - whether they have a picture perfect blog or in real life - perfect manicure, beautiful house and new car. Hang in there! Sparkle is a great word...finding it both in yourself and in others. I simply adore your word. Sparkle ---you already do that. I think your voice on your blog shouts sincere and genuine. Love it ---I think I have let the worries of sounding too perfect hold me back on my blog sometimes. I need to get over that. Thanks Stacey for being a sparkler. I love your word of the year! SO much fun, and it's so you! :D BTW I have to ask about the cute frame in the last photo with the roses in it. I love that! I love this post, "sparkle" fits you very well. BTW, I love your new profile picture. I have to say--I never would of thought of the word 'sparkle' for a word for the year!! Great pick--!! and we all we always worry about our kids--no matter how old they get!!! Sparkle is a great word! I think we could all use a little of that...ps~ love your pretty picture! Learning a little more of the real you is a treat, Stacey. I'm with you on the Crossfit membership; doing the best with what we have is all right! Grieving is the truest form of having loved. I knew #3 was a non-truth. We never stop worrying. For a minute, I was afraid I'd be dealing with lots of glitter this year, until you clarified sparkle. whew! 'Being real' can set us free to be more ourselves. Thanks for sharing. Love your word 'sparkle'. I love your new profile picture also, you are 'sparkling'. Happy Weekend, Stacey! I scored 100 on your little real test! I love your word of the year “sparkle”. On a side note, my son and DIL do CrossFit and they have tried to convince us that we can do it...I am not that foolish! I really enjoyed this Stacey, you made me wince and smile! I think sparkle is a great word for the year, my motto for the year is to enjoy every moment, rain or shine...similar to your sparkle, as in try to see the best or the positive of the situation...being negative is a waste of precious energy! Happy 2018! Ok, I'm a born and raised Texan and have never heard of Donkey Basketball. A byproduct of city living? Too funny! It's true we never stop worrying about our children...I asked my MIL if she quit worrying about hers once they were grown and she said, "no, and then you have grandchildren to worry about". Sigh. You do sparkle! It's a great word for the year! May you continue to sparkle and bring joy to those around you! Sparkle is the best accessory Stacey. What a great new word for the new year. Loved reading your true or not. Blogging has come a long way since I started 7 years ago and has changed a lot. Some for the good and some not so good. I love that we all now have connected and can be real with each other. We can share our lives and feel safe to do so. Keeping it real is the best part of blogging in my opinion. We put our best pictures forward for our decor and crafts etc. but we also can share our sadness, loss and happy occasions of our lives too. I love that you and Jemma have shared the Perk Project. Happy Weekend. My husband used to say, once your a parent, you're always a parent, even when you die. My hubby was a wise man. My boys are 39 and 41 and I still think of them as kids. I wish you and your family health, happiness and above all, love, in the new year and I know you will pull through the bad times because you can "sparkle". Good evening Stacey, like many of your friends have said before me,sparkle is a lovely word. We all need a little sparkle in our lives. I am 65 years of age and I can attest to the fact that life isn't perfect, that we all experience ups and downs at some period during our lives, but the key is to have hope and I have that in abundance. Hope has seen me through many difficult and sad events. I agree wholeheartedly that no matter the age of our children, we never stop worrying about them. I think the older I get the more I worry about my children. I think I had you nailed. We have many of the same values and heath issues of our own and family. 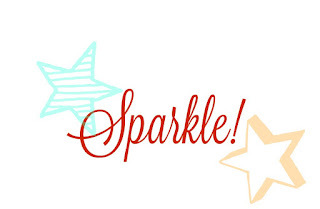 I hope you sparkle and find sparkle this year...just love ya, Stacey! I loved this post and I learned some new things about my friend! I laughed out loud at your true or not number three. I have two boys, my baby is 30, and my oldest is 34. It's hard to imagine, but I think I worry about them more now than when they lived with me. When they lived with me I could keep an eye on them and I knew what was going on, now they're out in the world, and I have to wonder. Great post, I enjoyed it, and enjoyed looking at your open shelves. So sorry to hear about your father. Thoughts and prayers are with him and your hubby. OK...truth be told...I hate to exercise!...but my hubby gets up at 5am every day to exercise...sometimes I feel guilty that I am not out there with him exercising, etc., but that lasts about 60 seconds! What a great post. I feel the same about my blogging space. I want it to be a positive, and hopefully uplifting space but I'd also like it to be real. I agree, just because your kids are grown doesn't mean you quit worrying and giving up control is hard...no joke. I also had to kind of chuckle about the frugal part. I'll drive to 3 different stores to look for a sale on cereal, etc...but shop online too. Hope you're having a great week! I knew you'd never stop worrying about your kids no matter how old they get! I guessed correctly on all the True-False and loved your honesty about the Cross-Fit and snug clothing. I also really like your word for 2018....Sparkle is a very good one! I also really like your open shelving!